The Fukushima disaster of 2011 shook the globe, arousing warm debate and new research within the academic fields of countries in both the West and the East on issues related to nuclear security, public trust, government governance, risk governance and risk perception along with technological and social aspects. The Fukushima incident not only revealed the importance of risk governance in the East Asian region, but also became an important turning point in the restructuring of energy in several East Asian nations. However, the regulatory culture in East Asian countries is by nature different to that of their western counterparts; the history and culture of East Asia has formed East Asian countries’ unique regulatory characteristics. This book aims to establish a risk governance structure for the East Asian region, providing a completely new perspective for both practical implementation and the academic field. It focusses on the problems of risk governance in East Asia. Through a discussion of the risk related issues raised by contemporary globalization, this book outlines the unique form of East Asia’s risk governance architecture. 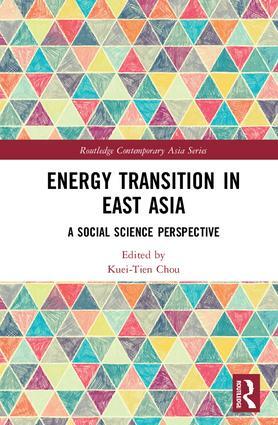 It brings together the work of top academics from Japan, South Korea and Taiwan to provide a common picture of how these three countries’ governments are dealing with the energy transition brought on by the climate change crisis. The various aspects of East Asia’s unique regulatory culture and governance models are placed into context, while East Asia’s risk governance theoretical framework is outlined. Kuei-Tien Chou is Director of Graduate Institute of National Development and also Director of Risk Society and Policy Research Center, National Taiwan University. He got his doctoral degree in sociology from Universität München. His research interests are in the field of technological risk, climate change, risk governance, technological policy-making, public participation, science & democracy as well as East Asia modernity.